Illustration: Valerie Goodwin. African Burial Ground II, 2009. Valerie Goodwin is a textile artist that probably approaches the medium through a realatively unique perspective, that of an architect. She has both a degree and Masters in architecture and has taught architectural design. This gives her a strong and definite edge to her work akin to that of the fairly structured disciplines of cartography, archaeology and architecture. Illustration: Valerie Goodwin. City Grid IV, 2007. 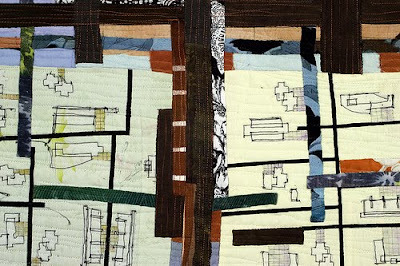 The use of planned and structured surfaces could give her work a cold and clinical appeal with quilts appearing as hard and intransigent geometrically set grids, but instead her work, although much of it based on the city grid map, takes into account the human element that makes a town or city. What at first glance what seems to have been both scientifically and geometrically planned within an office as a concept or task, takes on the role of an organic human landscape. This becomes more apparent when looking at Goodwin's work in detail, as what appears at a distance to be a regular street plan of any typical city or town across the planet, at a close up level shows numerous human interventions. Buildings and outhouses show that they are of different sizes and shapes to suit the needs of individuals, and house boundaries quickly become a fluid patchwork of interlocking properties which softens the geometry of the architectural office, producing a haphazard but liveable environment. After all, these maps are drawn to show human patterns of habitation, not that of the benefits of producing tight geometrical grids. Illustration: Valerie Goodwin. City Grid IV (detail), 2007. Goodwin has also taken the element of archaeology as an interesting added layer to the story of human habitation. Architectural archaeology allows the city to be peeled back or layered forward, depending on the time frame. This allows Goodwin to play with transparency and density, layers and half-layers and colour combinations, juxtapositioning generations of human habitation in a grand collage of life across countless generations of our ancestors. Illustration: Valerie Goodwin. Labyrinth of the Hidden Goddess, 2005. 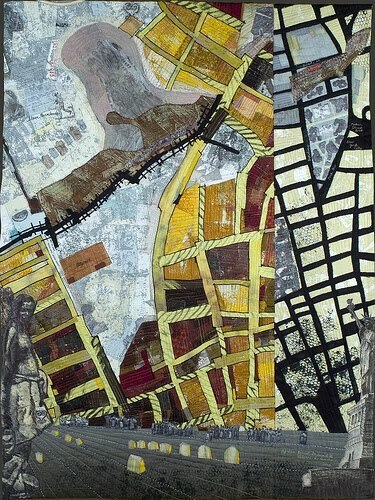 While some of her quilts show segments of city life though the arrangement of partial maps, most are self-contained and are a literal self-functioning organism, which seems very reminiscent of the countless Bronze Age city states that were scattered throughout the Mediterranean, Asia and Africa. 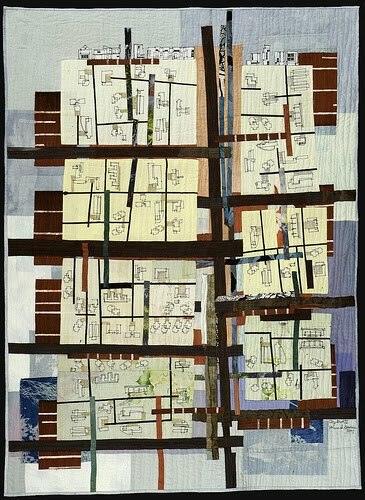 Indeed some of the themes of the quilts do seem to be reminders that the city was not always the planned and faceless machine like grid that we often associate with modern city living, but a spiritual and organic part of the landscape. A city that both grew and retreated, was built over layer upon layer, walls within walls, countless ancestors becoming part of the fabric of the city, in fact a human environment for living rather than existing. Illustration: Valerie Goodwin. 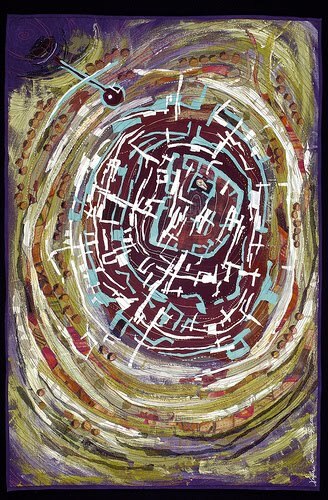 Labyrinth of the Sleeping Goddess, 2005. Goodwin has exhibited across the US and holds a number of workshops, which are mostly design orientated with an emphasis on the processes and development of art and design. She has a comprehensive and detailed website Studio Quilts. For those interested, there is also a flickr gallery with many of 'work in progress' photos, which can be found below. Thank you for sharing your insights about the artwork of one of my favorite artists. 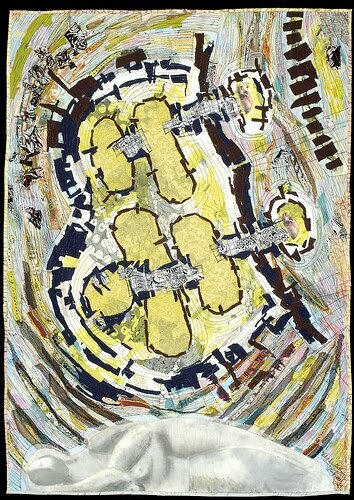 I, too, believe that much of the power of Valerie's artwork comes from the juxtaposition of the built and the organic. V.
Thanks for your comments. This article is one of a number of pieces that I will be writing on various textile artists in the coming weeks, so I hope you carry on reading and perhaps you'll come across more of your favourites.